I’m working on a project that requires frequent client approval. This means I’ve been spending a lot of time rendering and compressing and uploading and looking at progress bars. I wanted to automate the process. Automator provided a straightforward way to do this. I’ve built an Automator droplet that will compress videos, upload them to an FTP server, and optionally send an email to let you know when everything’s done. It should run on any modern Mac and is an elegant solution for modest compression needs. The droplet is great for simple tasks, but not when a variety of output formats is required. For greater control, we can use Compressor for compressing and attach it to an Automator action that handles uploading. I prefer using Automator for uploading instead of Compressor’s built-in Remote Destination feature because the latter saves local files in /var/tmp, which is a recipe for lost renders. Download and install Peter Dekkers’ free Upload to FTP Automator plugin. 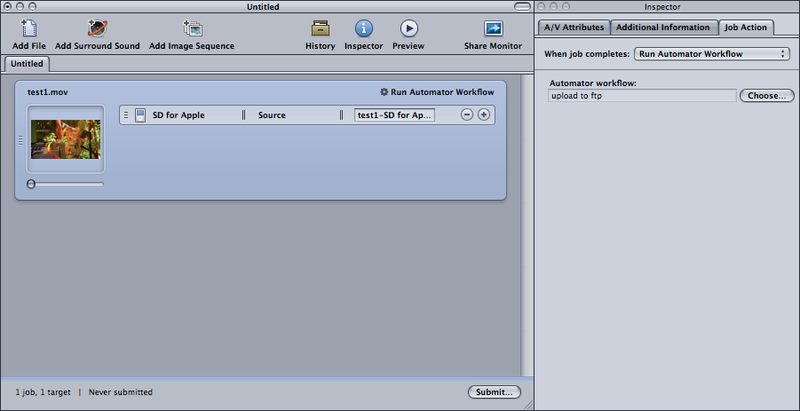 Open Automator and make a new workflow with Upload to FTP as its only action. 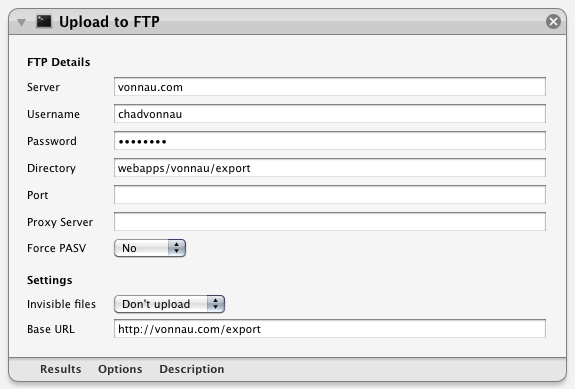 Enter your FTP server settings and save the workflow. When rendering in Compressor, select Run Automator Workflow as your Job Action, and choose the workflow you created. That’s it. Submit your render and when Compressor is finished rendering, Automator will upload your videos for you. If you’d like to see a working example of how to send a notification email from this workflow, download the Compress & Upload Droplet above.